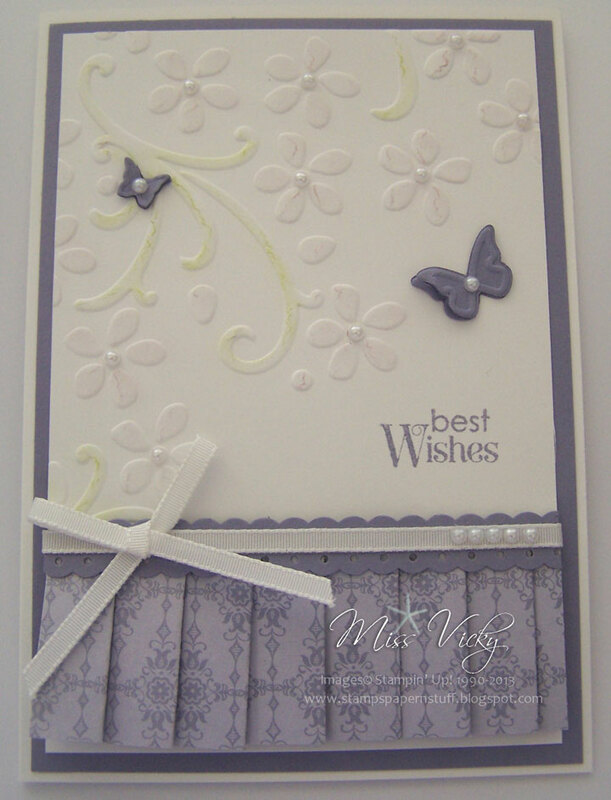 Today I am going to share with you one of the cards we created in our Creative Cards Class last Tuesday. 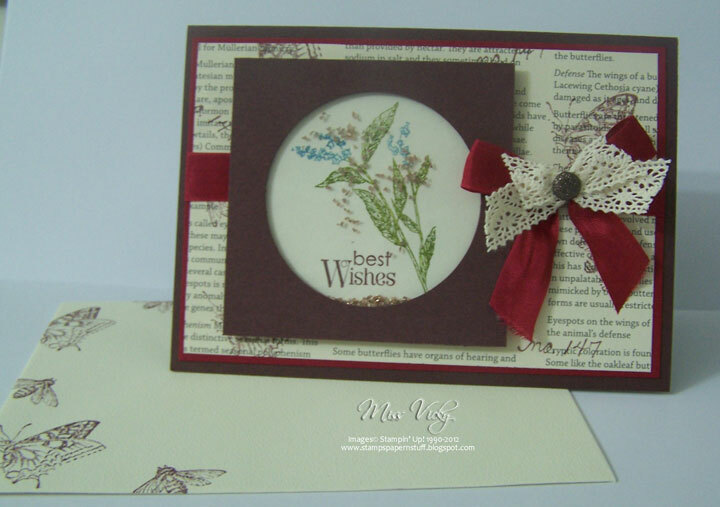 It is using the lovely Petal Passion Suite, Page 22 of the 2018 Occasions Catalogue. 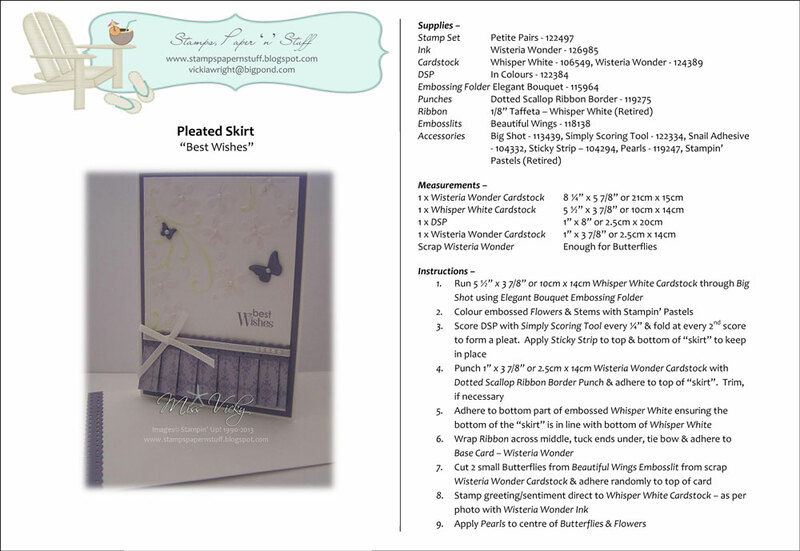 It includes the Petal Palette Stamp Set, Petals & More Thinlits, Whisper White Organza Ribbon, Petal Passion Embellishments & the Petal Passion DSP. I am loving this Suite, especially the papers. The Stamp Set & Thinlits are also available as a Bundle. I actually took my inspiration from the samples on Page 22 although changed a little to suit what I wanted. I had a lovely morning & the ladies said they loved their cards which is always an added bonus. I’m a little late in posting today – sort of got sidetracked on our walk this morning. I have set myself a goal in that I am going to use every stamp I have from the catalogue this year. It is so easy to overlook some of our older favourite stamps in favour of the new ones from the Occasions & Holiday Catalogues. Don’t worry, I will be using my newer stamps too, but just wanted to dust off my older stamps. Today’s card is one using “Remarkable You” Stamp Set but with a little bit of colouring, embossing & fussy cutting, not to mention a different layout, it can give the stamp a whole new lease of life. I’ve kept my card very simple letting the flower speak for itself. Teaming it up with a bright Card Base & touches of Black, I think it makes the image “POP“, but I would really like to know what you think? 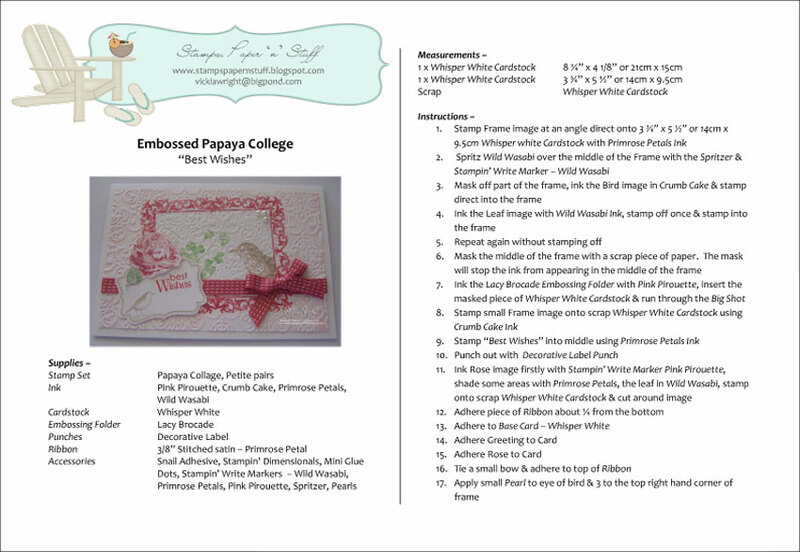 If you click on the link above the photo, you will be able to download the Free Tutorial to create your own card. Don’t panic if you don’t have the same supplies, just replace them with what you have in your stash. You could even create the background using DSP. 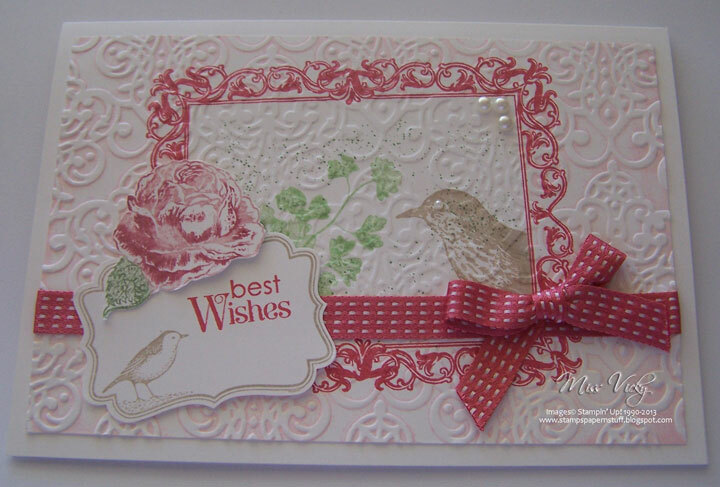 Our card we created in Crafty Creations yesterday arvo was using last year’s SAB products. Yep, I still have a heap of the gorgeous “Sweet Sorbet” DSP sitting on my shelf & it is the perfect time to use it, as this is my volunteer class. I decided that to take the best advantage of this paper was to use the “Sunburst” Technique for our card. 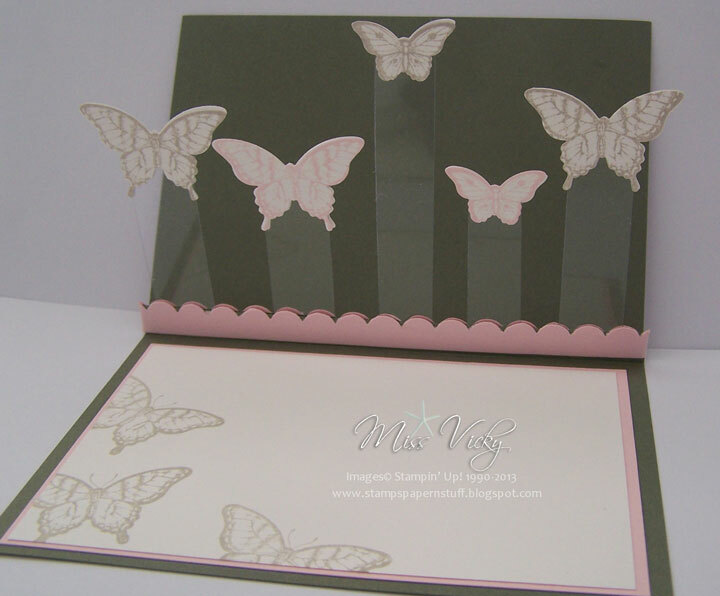 We had a full class yesterday which was great & everyone seemed to enjoy creating their card using this technique. In fact, I gave each of the ladies a little bit of homework where they were given enough DSP to create another card using the same paper & technique. I will post mine in a couple of days. 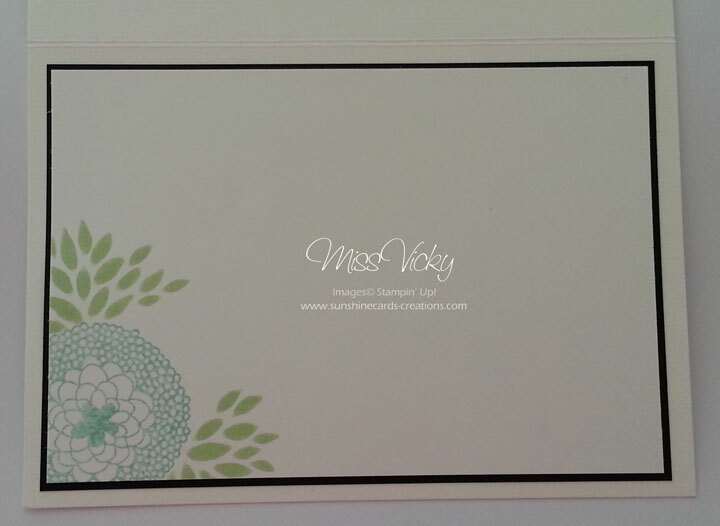 If you click on the link below, you will be able to print your own tutorial to create your card. 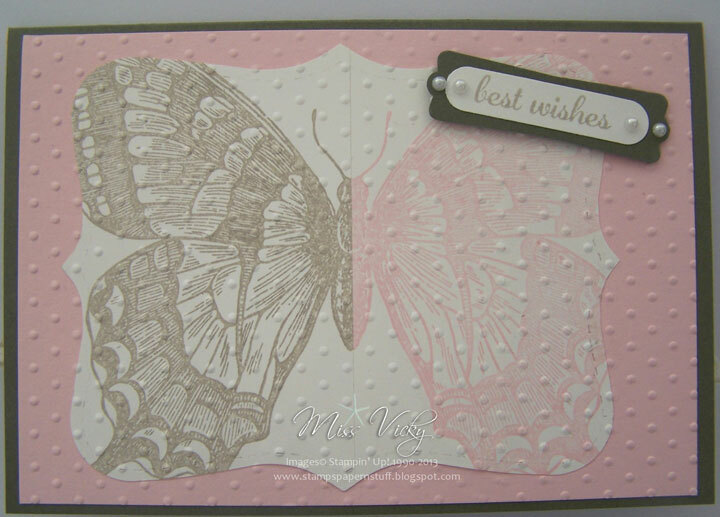 In one of Technique Classes last month, we used the great stamp set “Swallowtail” & applied it to the technique – “Split Negative“. I was really happy with the way this card turned out, as it is a little different to what I’ve seen using this technique. I wanted to try a couple of non-traditional colours instead of the black & white that is usually the ones used for this technique. Today’s card is one with a bit of a surprise inside. The 2nd card will posted in a couple of days. I am so far behind in my posts that I think I have enough cards to post for the next couple of months without adding any extras I’ve created in between posts. Where does the time go???? Our card today is one we created sometime ago in Crafty Creations. As most of the ladies have either a Big Shot or Cuttlebug, once a month, we concentrate on these products. It is usually a great way for them to learn how to use their tools. Included in this class we also concentrated on the Technique – Chalks or Pastels, including learning how to create a pleated skirt from paper. I let the ladies know what we will be creating each week & what to bring along if they want. This way, they are using the “stuff” they may have & familiarising themselves with their own “stuff“. I took along a number of different Embossing Folders for the ladies who don’t have a machine or Folders. I think this is another card I saw on Pinterest, but am not that sure. Please let me know if you recognise it, as I would love to give you credit for the inspiration. 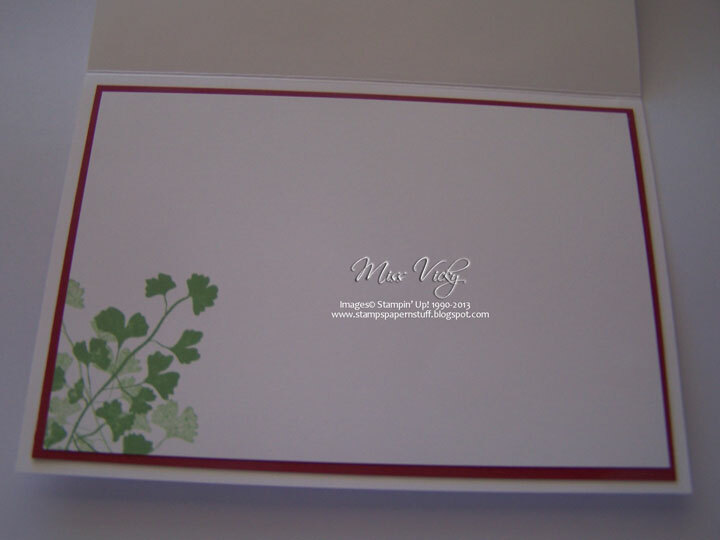 … has been created using yet another retired Stamp Set from Stampin’ Up! In fact I’ve used 2! I lov e it when I can use some of my Retired Sets. 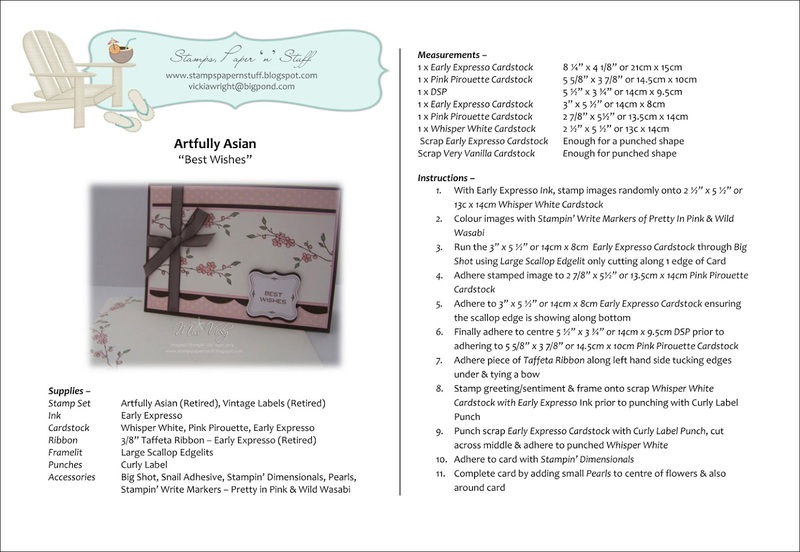 In fact, one of them had never been used, while a couple of the images from Artfully Asian had only seen ink once. I must admit I saw this card some time ago while surfing the internet & as usual I didn’t save it but filed it in my brain. I’m not even sure if I have created it the way I remember it, but hopefully the ladies in my volunteer Friday class will enjoy creating it. 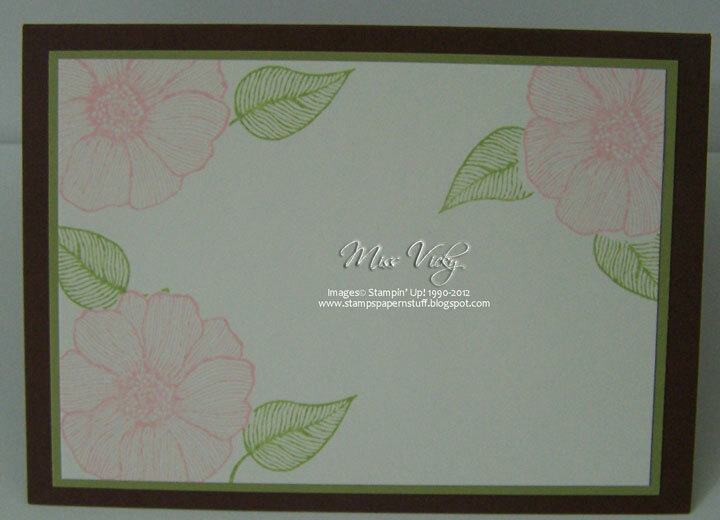 After some deliberation, I decided to use my Stampin’ Write Markers to colour the delicate flowers. I was very careful not to spread the ink from Early Expresso around & mix it with the Markers. 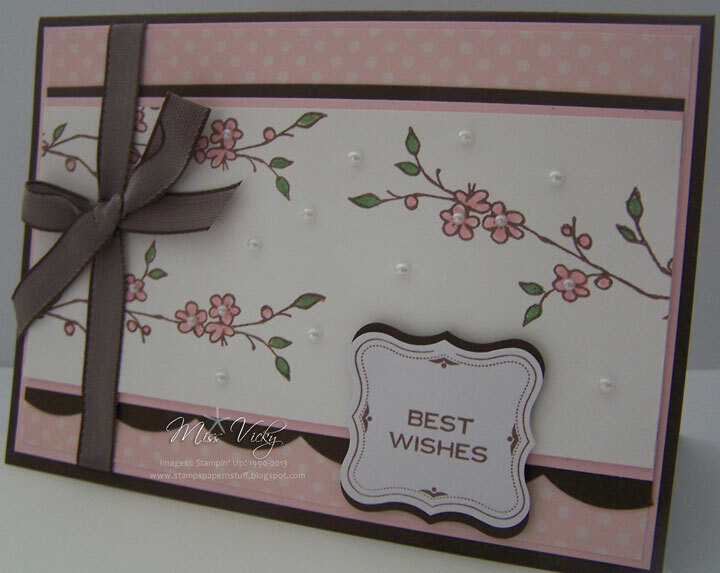 To take away the blank canvas a little more & to bring the flowers to life, I then added tiny Pearls to the centres as well as randomly over the card. to create your own card. I’m a little late in posting this which means the challenge is probably over. I have been unable to post photos to my blog. Have all the information entered but no photos – but I think I have finally found a way, fingers crossed. If this works, then I can actually catch up with my posts. This week, I found a little time to play along with a challenge. It seems like forever that I’ve played along with any challenges. It also come at the right time as I needed a card for a birthday that is coming up in the next couple of weeks. The challenge is over at Paper Craft Crew Challenge Be sure to pop on over & play along if you get the chance. I’ve been teaching Rosettes to my Volunteer Class on a Friday. Today’s card is showcasing one of them. It is a very easy card, with just a little bit of punching & scoring. I did say earlier that I was way behind in my postngs & this just goes to prove it. This card was created back in September. 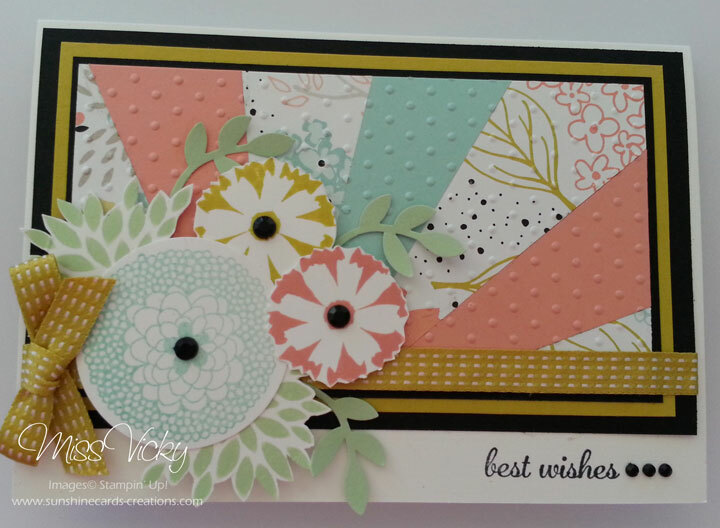 What a great challenge we were set this week over at Sunny Challenges & Creations. 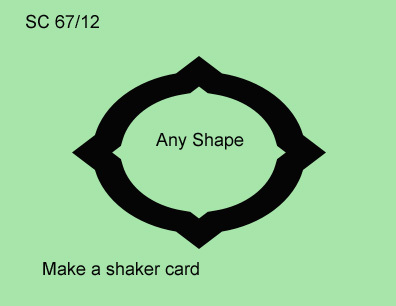 All we have to do is create a Shaker Card – NO layout!!!!! If you are like me, then I haven’t created one for so long that I can’t remember the last time I did one. I randomly stamped images over the DSP with Chocolate Chip Ink, prior to adhering to the Cherry Cobbler Cardstock. I ran a piece of Cherry Cobbler Ribbon across the middle, tucked ends under & adhered to the Base Card with Snail Adhesive. 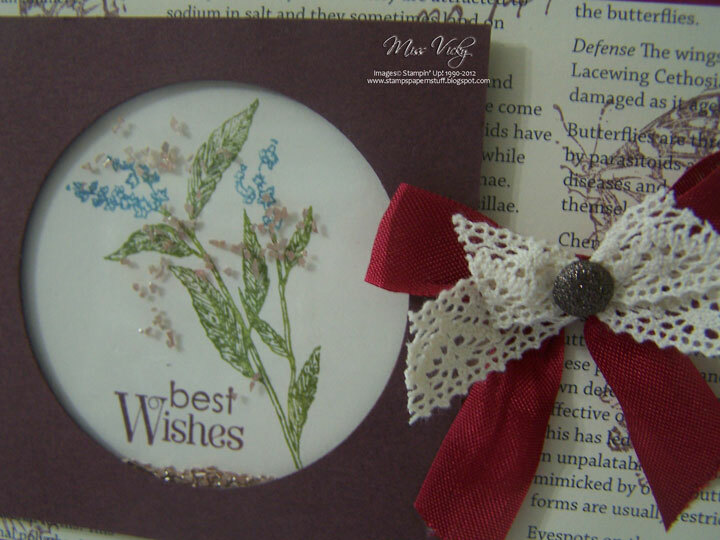 For my window, I inked my image with Stampin’ Markers – Old Olive & Marina Mist, stamped direct onto Very Vanilla, inked my sentiment in Chocolate Chip Ink & stamped onto the same piece of Very Vanilla Cardstock. I placed my images onto the Cardstock, so that they would be able to be seen once I had adhered the top piece of Chocolate Chip Cardstock. As I didn’t have any Double Sided Mounting Tape, I made my own. I applied Sticky Strip all around the outer edge of my stamped piece of Very Vanilla Cardstock, ensuring that all sides were covered. I cut 2 pieces of thick Cardboard – from the Glitter Paper – & adhered to the tops of the Sticky Strip, ensuring that all areas were covered as I didn’t want any pieces of the glitter to escape, applied another layer of Sticky Strip, carefully poured Glitter onto my image – not too much as you don’t want it to take over – punched a circle into the middle of the Chocolate Chip Cardstock with the 2 1/2″ Circle Punch, adhered the Window Sheet to the wrong side & then finally to the top of the Sticky Strip. 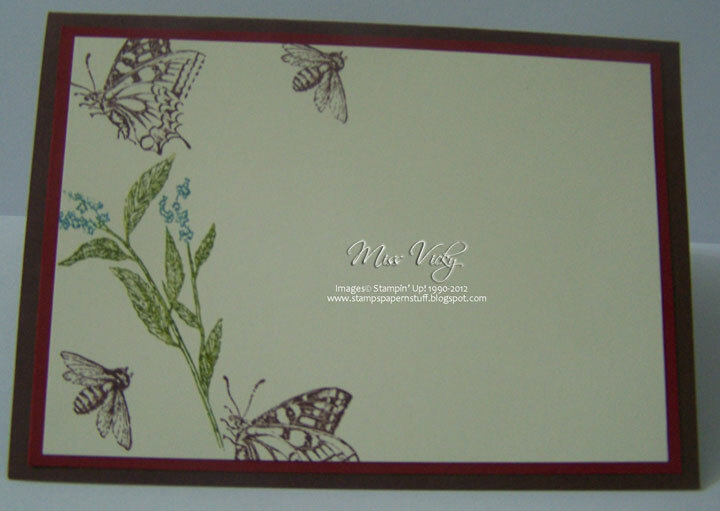 I applied Stampin’ Dimensionals to the back of this piece & adhered to the card. I tied a bow with the Cherry Cobbler Seam Binding, found 2 small pieces of Crochet Trim that happen to be in the same container as my Ribbon & decided to use them as well. A Glimmer Brad was attached to the middle & finally adhered to the card with Mini Glue Dots. We hope you will jon us this week for this fun challenge. Head over to Sunny Challenges & Creations to chek out what both Kris & Vicki have created, create your project, post to your blog or on line group & then link back with Mr Linky. We would love to see your creation! ﻿﻿﻿﻿﻿﻿﻿﻿﻿﻿Our card last Friday at Crafty Creations was to do the Technique – Basic Masking. I choice to go with Chocolate Chip, Certainly Celery & Pink Pirouette– not colours I would normally put together, but I am really loving the final result. Mind you, when I started the card, I had no idea where I was going, only knowing that I wanted to use the stamps I had sitting on my desk. I am also finding myself going back to the softer colours which I think are sadly being neglected – by me anyhow! I adhered a piece of Ribbon across the middle of the DSP, tucked ends under, adhered to the piece of Certainly Celery & finally to the Base Card – Chocolate Chip, all with Snail Adhesive. 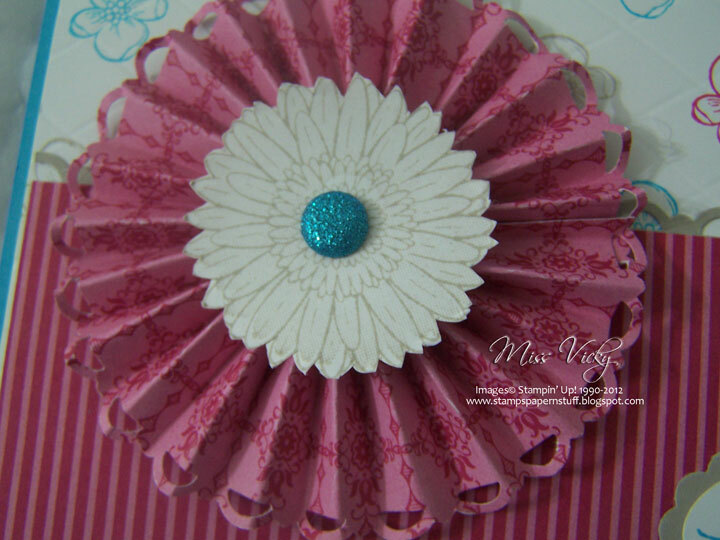 The piece of Pink Pirouette Cardstock was torn along the bottom, sponged across the tear & around the edges & adheredd over the top of the Ribbon using Snail Adhesive. 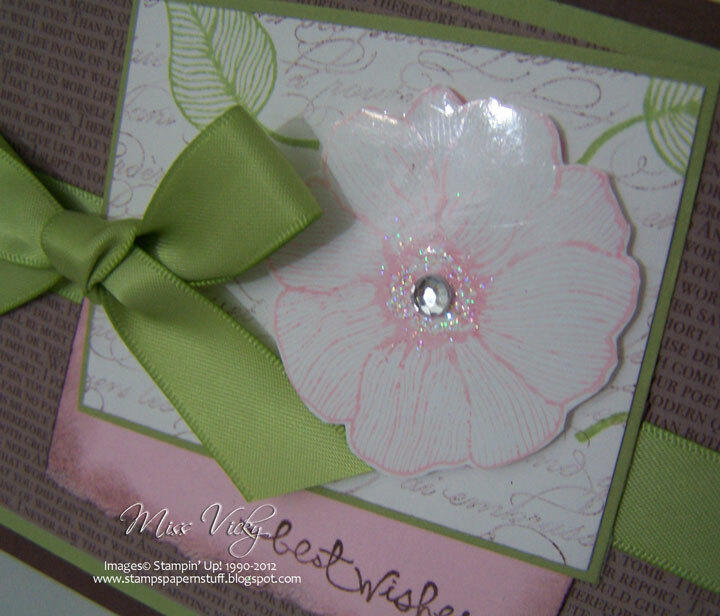 I stamped my flower image onto the piece of Whisper White Cardstock with Pink Pirouette Ink, stamped again onto a scrap piece of paper, cut it out & used this one piece for my Mask. 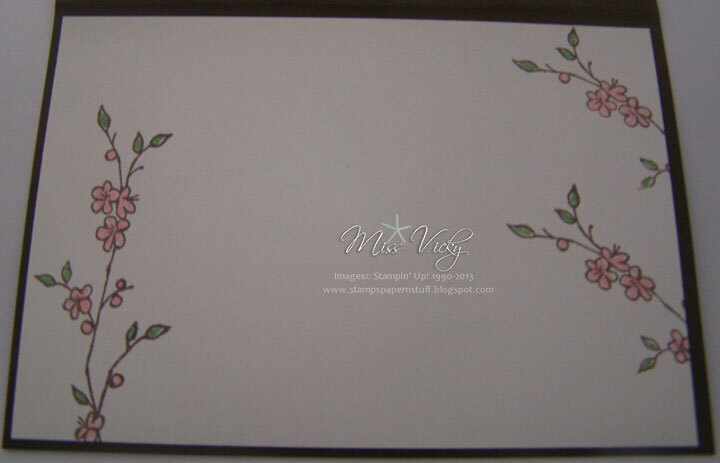 While the stamp was inked in Pink Pirouette, I again stamped onto a scrap piece of Glossy Cardstock, cut out & set aside. This was by accident as I didn’t realise it was glossy until I was cutting it out, but decided to leave it the way it was. 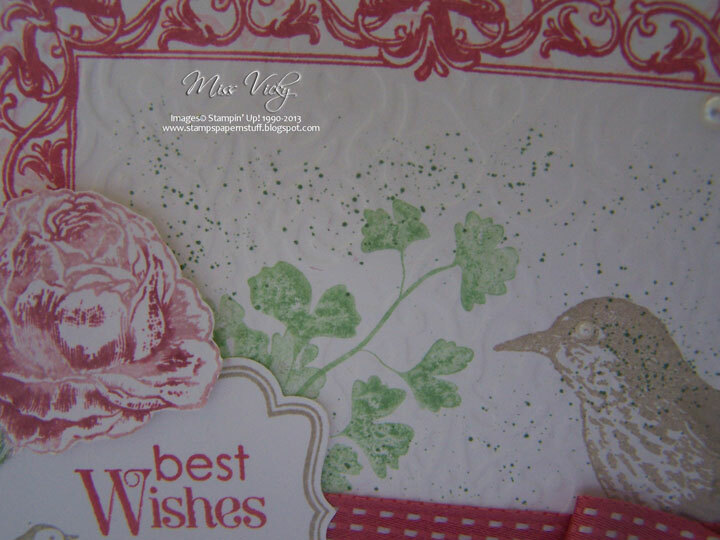 I stamped the leaf images around the flower & created 2 Masks for the leaves. After applying Dotto to the back of my Masks, I adhered them over the matching images prior to inking my background stamp in Chocolate Chip, stamping off twice & then stamping onto the piece of Whisper White Cardstock & over the masked images. This piece was adhered to the piece of Certainly Celery & finally to the Base Card. 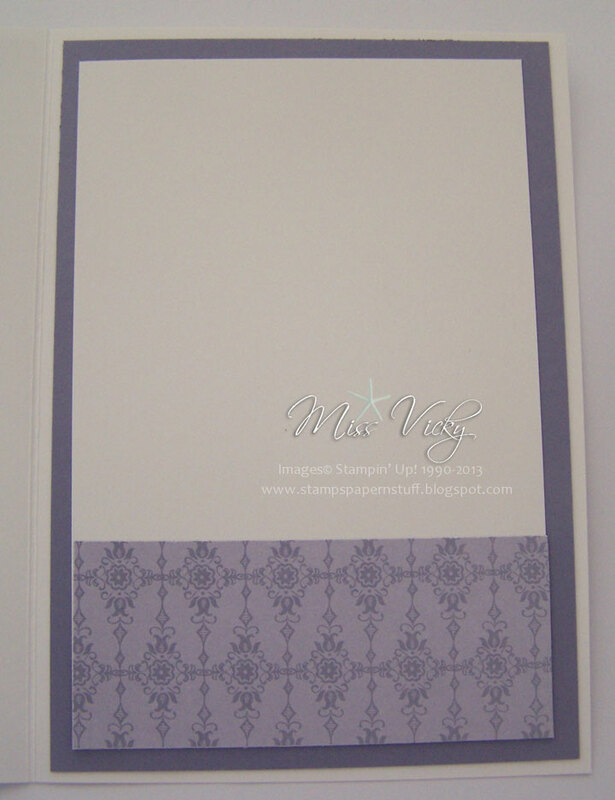 I adhered the Glossy image to the top of the stamped image with Stampin’ Dimensionals, added some Dazzling Diamonds to the middle with my 2-Way Glue Pen & popped a Rhinestone in the middle. 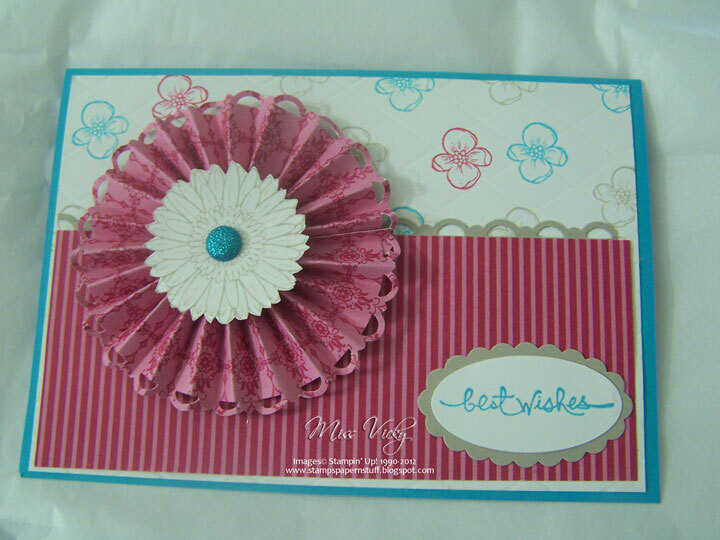 I tied a bow with the Ribbon & adhered to the card with a Mini Glue Dot. The sentiment was stamped onto the bottom of the piece of Pink Pirouette in Chocolate Chip Ink.